Once again we turn our thoughts towards Native peoples and the first Thanksgiving celebration. Last year when we wrote this blog we discussed the three sisters, corn, beans and squash and their likely spot on the table. This year, our focus will turn to the main course of the celebration on most dinner tables in the United States for at least the past 100 years- the Turkey. Thanksgiving did not become a National Holiday until 1863 when President Lincoln issued a proclamation declaring the date as the last Thursday in November. Much has been written about the foods served at the first Thanksgiving and a record of the event published in 1622 (Mourt's Relation)refers to the gathering of “fowl” which likely included wild ducks, geese, quail and other game. 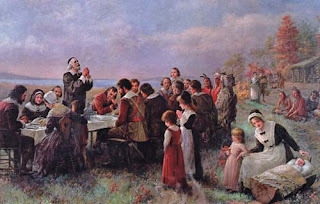 The pilgrims referred to all birds as “fowl” and did not make a distinction of turkey so we can not determine with any certainty if turkey were actually part of the celebration. 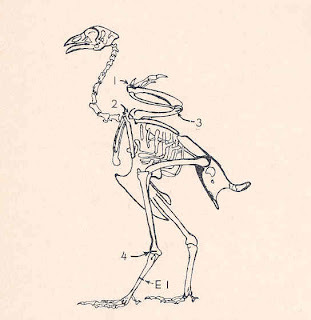 Archaeological excavations have yielded the faunal remains of turkey (Meleagris gallopavo) at most Native American sites of the Late Woodland period. An interesting assemblage from the Eschelman Site, Lancaster County provided evidence of the butchering and processing methods employed by Native peoples. Eschelman Site was the midden or “garbage dump” site for the Susquehannock Washington Boro Village which dates from approximately 1600-1625. The population estimate for this village is roughly 1700 (Kent 1984) based on archaeological evidence of house size and stockade lines. This was a fairly large population which would have required a varied food supply. The species present in this assemblage include the usual deer, bear, beaver raccoon and turkey to identify a few of the more dominant. Formulas that have been developed for estimating “minimum numbers” (MNI) of species were employed in producing the following data. Butchering marks visible on the faunal assemblage indicate that turkeys were either skinned or plucked and then butchered to remove heads, feet and wings at the shoulder joint. The bird was then placed whole in a pot until the meat was removed and the bones were “boiled clean”. No cut marks were present on femora, dorsal vertebrae or sternums and no charring or scraping marks were visible. The relatively high number of turkey available in this collection brings about the question of whether this is a normal or high percentage in comparison with other Susquehannock sites. Of the analyzed data available it would appear that this is a higher than normal percentage of turkey represented. The following table compares the minimum number of individuals (MNI) for each of the five taxons previously identified in the assemblages from four Susquehannock sites. While the data suggests that turkey played a larger role in the diet of Native peoples in the period from 1600- 1625, it is also understood that the assemblage from Washington Boro, the Eschelman midden site may contain a larger sample size due to the nature of the site. The pattern though does raise some interesting questions in the role of village size and demand on the turkey population. Strickler site population is estimated at 2900 (Kent 1984) an increase of 1200 people since the Washington Boro site. The population of Susquehannocks declines after about 1660 and estimates drop to 900 individuals for the Byrd Leibhart site. Could demand have exceeded supply and thus fewer birds were available to the residents of Byrd Leibhart? Historic accounts document over hunting of turkey by early settlers which led to a rapid decline in the species. By the early 1800’s the population was almost eradicated as hunters harvested them without any regulation. The remaining birds were found in the central counties in the ridge and hill top woods of Pennsylvania. Demand for lumber and the resulting stripping and deforestation of “Penn’s Woods” further decimated the flock. The creation of the Pennsylvania Game Commission in 1895 and efforts to regenerate forests saved the estimated few thousand birds from complete extirpation. 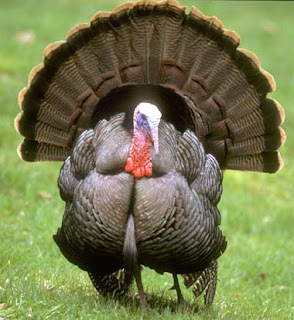 It was not until 1905 that a limit of one turkey a day for a six week hunting season was introduced. Various methods were employed over the next fifty years including the raising of turkeys by the Commission for release and wildlife management practices. This increased regulation and population supplements led to the first state wide hunting season in 1954. Ten counties did not have a natural population of turkey and those areas were supplied with “game farm raised” turkeys. 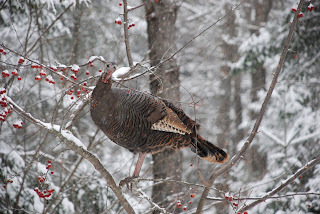 Careful control over the next fifty years and the “trap and transfer” program implemented by the Game Commission restored the turkey population and led to the elimination of turkey farms operated by the Commission. Ben Franklin wrote to his daughter regarding his disappointment that the Bald Eagle was chosen over the turkey as the National Bird. Kent, Barry C. 1984. Susquehanna's Indians. Anthropological Series No. 6 Pennsylvania Historical and Museum Commission, Harrisburg. Guilday, J.E.,P.W. Parmalee, and D.P. Tanner. 1962. Aboriginal Butchering Techniques at the Eschelman Site (36La12), Lancaster County, Pennsylvania. Pennsylvania Archaeologist 32(2):59-83. We’re busy folks here at TWIPA and we’d like to think we do it all, but we know that’s not the case. With our field season at Fort Hunter finalized and all the pomp and circumstance of Archaeology Month celebrations dispensed and comfortably in the rear view mirror, the staff of the State Museum Section of Archaeology can return to the business of managing and curating the archaeological collection of the Commonwealth for its citizens, now approaching 5 million individual artifacts. What are these artifacts, where did they come from, why are they sent to the State Museum of PA? These are some of the typical questions we hear from people not familiar with the state of archaeology as its practiced today in Pennsylvania and across the nation. It is a difficult task to fully explain the context in which the majority of archaeology these days takes place in the span of a 700 word or so blog post, but it is important stuff so we’re taking a stab at it anyway. We’ve touched on this topic in several previous posts so if you have the time we encourage you to do a little “digging” through the TWIPA archives. Most archaeology today is conducted prior to some type of development; roads, bridges, housing subdivisions, dams, prisons, railroads, post offices, courthouses, pipelines – you get the idea. All of these projects have the potential to disturb or destroy archaeological sites. Fortunately, Section 106 of the National Historic Preservation Act of 1966 created a framework as part of any federal undertaking by which sites can be identified, evaluated, and if warranted, destructive activities mitigated. In a nutshell NHPA acknowledges that it is in the best interest and to the benefit of the American people (current and future generations) that significant cultural resources, historic and prehistoric, be documented and preserved where possible. It also recognizes that federal agencies have a responsibility to take into account adverse effects their development projects may have on these significant cultural resources. If this is beginning to sound like contorted legal mumbo jumbo, we apologize, but that’s what it is. While the artifacts themselves are the property of the landowner on whose land the site was excavated, in Section 106 projects the information recovered, the data (the field forms and notes, artifact inventories, photo documentation and reports) is owned by all of us, as we the taxpayers are ultimately footing the bill for not only the development but also the preservation efforts. More often than not, the landowner understands the artifacts have more scientific value than they do monetarily, and generously donates them to the State Museum where they are incorporated into a comprehensive database and made available to researchers the world over for a wide variety of scholarly studies, as loans to local historical societies, and of course permanent and temporary exhibits both large and small in the Anthropology and Archaeology Gallery of the State Museum, as well as other historic sites administered by the Pennsylvania Historical and Museum Commission. One common criticism directed towards archaeologists is that results from these excavations are not shared with the public often enough or in a timely manner. Doing our bit to dispel this shortcoming, we’ve contacted some good people at PennDoT, and they were all too happy to pass along a link to popular publications here , resulting from transportation projects. The page is a little buried, then click "kids page" and then click "highways to archaelogy". This week we’re highlighting a few of the unsung heroes of Cultural Resource Management (or CRM for those readers who don’t have enough acronyms in their life) the archaeological foot soldiers in the trenches, literally, doing battle with deadlines on compressed time tables, emaciated budgets and inclement weather – just to name a few typical obstacles. While we can’t claim these woes, or any others for that matter, are bedeviling this particular project, its recent appearance in the news seemed to make it a timely and appropriate example of Pennsylvania CRM archaeology. Currently underway is a road re-alignment near the borough of Macungie in Lehigh County, and people are curious and asking questions, and that makes it the perfect opportunity for the archaeology community to engage the public and hammer home the message that archaeology is good for them. 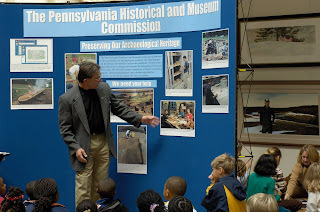 Wrapping up our celebration of Archaeology Month in Pennsylvania this year was the annual Archaeology Day at the State Capitol on Monday November 8th, held in the East Wing Rotunda. With so much happening in the world of archaeology, we just couldn’t contain everything to the month of October. Archaeology Day at the Capitol is one of the few times a year when the archaeological community has the opportunity to interact face to face with elected officials to impress upon them the value of archaeology and “make the case” for bolstering legislative support. An additional aspect of the program included undergraduate students from Indiana University of PA, Edinboro University of PA and West Chester University presenting posters on recent archaeological fieldwork from their respective institutions. State Museum Section of Archaeology staff was also on hand with a new poster highlighting the past five field seasons of investigations at Fort Hunter Mansion and Park. The now nearly-famous cannon ball recovered there in 2008 was also on display. Invited as featured guest speakers, Neil and Francine Patterson of the Tuscarora Nation gave a special presentation to third and fourth graders from St. Stephen’s Episcopal School and 7th graders from the Catherdral School in Harrisburg. Students were introduced to the heritage and culture of the Tuscarora including learning the difference between native corn and modern hybrid varieties, and the significance of wampum to native peoples. Thanks to Neil and Francine for making the trip from upstate New York to share their history of the Tuscarora with us. Afterwards the students participated in an exercise to produce cordage, an everyday yet essential material in prehistoric technology. Hands-on activities such as this engage young people and can open the door to an enriched appreciation for indigenous cultures. Archaeology Month 2010 has officially come to a close and hopefully you visited an archaeological site, watched a television show, viewed an internet site or read a newspaper or magazine account of an archaeological discovery during this time. For many archaeologists, the chance to speak with an interested public that is fascinated by an artifact or a site interpretation is incredibly rewarding. Annual meetings of archaeological organizations provide lectures open to the general public and members of the various societies. These venues offer a diverse menu to choose from in terms of subject matter all with a focus on some aspect of archaeology. In an effort to encourage students to participate in these meetings, scholarships are offered by these archaeology societies. Today we are announcing a new scholarship for the Society for Pennsylvania Archaeology to be awarded for student participants at their next meeting in April, 2011. The annual W. Fred Kinsey Meeting Scholarship will provide student membership to The Society for Pennsylvania Archaeology for one year, and a $100.00 award. Dr. Kinsey was a curator with the PHMC before going to Franklin and Marshall College and The North Museum from the late 50’s thru the mid 1980’s. His work on the prehistory of the Upper Delaware laid the foundation for much of the interpretation of this region of Pennsylvania. In addition to his contributions to archaeological investigations he mentored many students who went on to become significant archaeologists on their own merits. Students currently pursuing an undergraduate or graduate degree are eligible to apply for the W. Fred Kinsey Meeting Scholarship. Presentation must be a complete, single-author paper with PowerPoint slides (if appropriate). To be eligible for the award the student presentation must have been accepted by the program chair for the SPA annual meeting. Papers should focus on topics relevant to Pennsylvania archaeology. Award of the Scholarship requires submission of a single author paper, in electronic format (Word or WordPerfect) to the Program Chair by the regular submission deadline date for papers as set by the Program Chair. This year the deadline is February 25, 2011. Selection of the winning paper will be based on quality of original research, presentation and appeal to the avocational and professional archaeology community. The committee consists of at least three members of the Society, one from staff of the PHMC and one member from the education committee of the Society. Students would be eligible for both the Hatch Scholarship and the Kinsey Meeting Scholarship, but only one annual Kinsey Scholarship will be awarded from the fund. Presentation of award will be announced at the Annual Meeting of the Society for Pennsylvania Archaeology. The selected paper will be published on-line through the PHMC website and submitted for review to the editor of Pennsylvania Archaeology. Editor has final decision on publication. The link to the Society for Pennsylvania Archaeology will have additional information as registration opens for the meetings, but now is the time to be thinking about a subject of interest and conducting research. http://www.pennsylvaniaarchaeology.com/ The meeting is scheduled for April 8-10, 2011 in Morgantown, Pennsylvania and the Program Chair is Dr. Catherine Spohn cspohn@state.pa.us . The theme of the 82nd Annual Meeting will be “From Wilderness to Metropolis: Archaeology of Pennsylvania’s Woodlands, Farms and Cities”. On Monday, November 8th from 10:00 until 2:00, archaeologists from around the Commonwealth will gather in the East Rotunda of the State Capitol to celebrate the importance of Archaeology. This event will be sponsored by the Pennsylvania Archaeological Council (PAC), the Society for Pennsylvania Archaeology, Inc (SPA), the Pennsylvania Department of Transportation and the Pennsylvania Historical and Museum Commission (PHMC). These organizations will provide a variety of exhibits on Pennsylvania archaeology with the underlying theme “Save the Past for the Future”. The goal of this event is to focus the public’s attention on the significance of archaeological resources in the Commonwealth and to advocate for their preservation so that they may be appreciated and enjoyed by future generations. At 11:00 there will be a presentation by Neal Patterson, spokesperson and Francine Patterson, White Bear Clan Mother of the Tuscarora Nation entitled the Tuscarora Nation’s Journey Home. In June of 1710, a delegation of Tuscarora Indians was dispatched from present day North Carolina to meet with the Governor of Pennsylvania. They were seeking permission to relocate their people to Pennsylvania to avoid a war with colonists in North Carolina. The meeting was held on June 8th at Conestoga, Lancaster County where representatives sent by Lt. Governor Gookin and the Provincial Council met with the Tuscarora. The Tuscarora are Iroquoian speakers who left their homeland in present day New York for the Carolinas between 700 and 900 AD. At the Conestoga meeting, members of the Iroquois Confederacy invited the Tuscarora to return to their lands in New York. War delayed the move, but the Tuscaroras started migrating north through the Susquehanna Valley in 1713. They call this the "Journey Home" and Pennsylvania's role is a significant part of their heritage. This event is a unique opportunity for the public and archaeologists to meet with the Tuscarora and celebrate our common heritage 300 years in the making. This event is open to the public and your participation is encouraged and appreciated.